their dazzling performance of �?/span>That’s Entertainment 1�? arranged - also a complete sell out ! 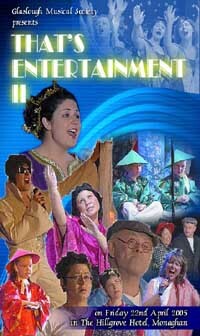 This production of “That’s Entertainment II�?has proved to be another huge success. Transport yourselves all around the globe, in a feast of musical song, dance and comedy with a talented and dedicated cast. Recorded in The Hillgrove Hotel, Monaghan in April 2005.